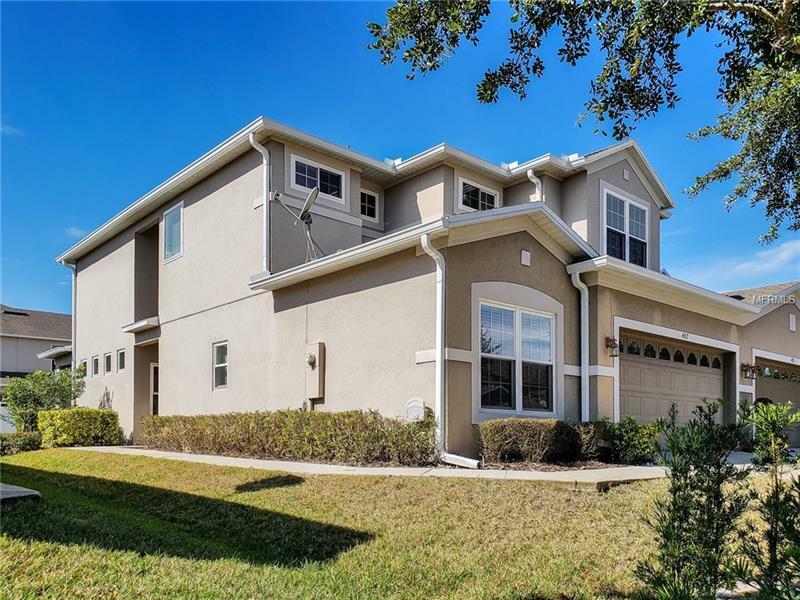 Welcome home to this beautiful 3 bedroom, 3 bathroom, oversized garage, corner unit, Taylor Morrison town-home located in the gated community of Lake Mary Landings. Wonderful designer touches throughout with high ceilings, archways, glass block windows, recessed lighting and much more! Updates include new front door, brand new a/c system 1 yr, energy efficient low-e double pane windows (20k upgrade), and water softener 2ys. Fantastic eat-in kitchen with natural granite counter tops, stainless steel appliances, 42" cabinets, breakfast bar, pantry and overlooks the living room. The living room has great natural light and sliding doors out to the screened enclosed patio. Finishing out the first floor is a bedroom that could be great for guests or even an office. Living room is wired for a surround sound system. Retreat to the master suite on the 2nd floor with a view of the pond, custom walk-in closet, dual sinks, shower and separate garden bath to soak away the stress from the day. Built in desk on the 2nd floor. Take advantage of the community amenities with a sparkling community pool to enjoy those sunny Florida days and a playground to run off some energy. This location is just off 17/92 giving you access to plenty of dining, entertainment, nearby shopping and Seminole State College, HOA covers exterior of home and roof as well, don't miss this great opportunity, schedule your viewing today!! Amenities Additional Fees: HOA covers exterior of home and roof, Buyer to verify with HOA. Pet Restrictions: Buyer to verify with HOA.